I bought Peruvian purple fingerling potatoes at the Farmers' market. Purple potatoes have a subtle grainy texture and I thought they'd pair perfectly with salmon mousseline. Beurre blanc sounds like a sophisticated element in a French dish, but it's really just a white wine butter sauce. 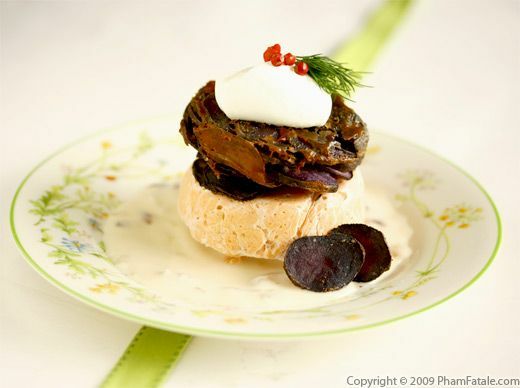 It's quite common in France and is often paired with poached fish and steamed vegetables. I think that it complements the crunchy potatoes and velvety salmon mousseline quite well. I finished each dish with a dollop of crème fraîche, some fresh dill and a couple of pink peppercorns. It's a feast for the eyes as well your taste buds. 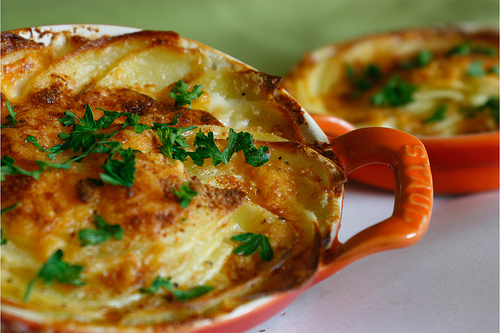 Use 2 to 3 tablespoons of butter total for the potato gratin. Create 10 (2-1/2-inch) disks with parchment paper. Line 10 (2-1/2-inch) round mini-molds with the parchment paper disks. Grease the molds with a generous layer of butter, then rub the garlic on the bottom and inner sides of each mold. In a saucepan, mix the cream, milk, the rest of the garlic clove and herbes de Provence. Bring to a near boil and let infuse for 15-20 minutes. Remove and discard the garlic clove. 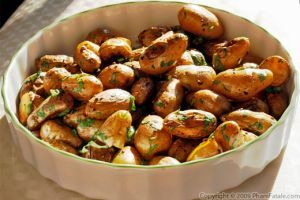 Cut the potatoes into 1/16-inch thick slices with a mandoline. Add the sliced potatoes to the cream mixture. Season with salt and pepper. Add the Gruyère cheese. Toss well. Spoon about 1 teaspoon of the lavender-infused cream in each mold. 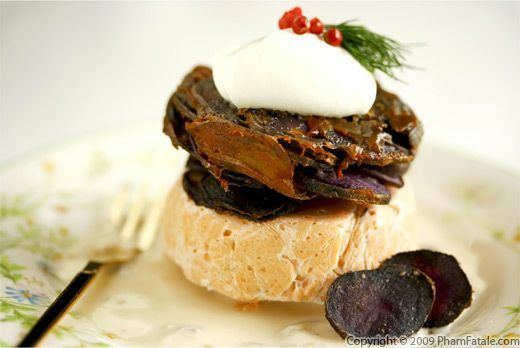 Gather the potato slices with as little cream as possible in a platter. Reserve the cream for later. Stack and pack the sliced potatoes into the molds. Make sure they're tightly and evenly packed. 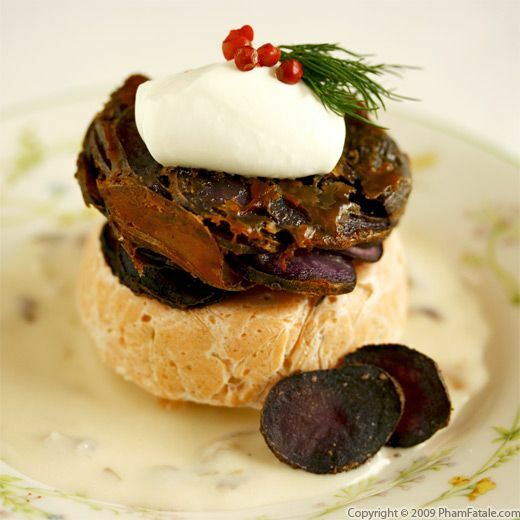 Pour the rest of lavender-infused cream in each mold, uniformly, over the layered potatoes. Top with small pieces of butter. Place the molds in a baking sheet. Bake for about 45-50 minutes. Check for tenderness of the potatoes with a knife. The potatoes should be soft and tender. Allow to rest for about 15 minutes before un-molding the potatoes. In a mortar and pestle, grind the saffron threads into a fine powder. Set aside. In a saucepan, heat the oil. Add the shallot and cook until translucent. Add the fish stock (click on the link for the recipe) and ground saffron. Add white wine (I added water) to the mortar and pestle to gather the possible remaining saffron powder. (Saffron is quite pricey, so you don't want to waste it!). Pour the saffron liquid into the saucepan. Bring the liquid to a boil and let it reduce by half. Add 3 tablespoons of crème fraîche. Season with salt and pepper. Once the sauce is thickened, lower the heat and slowly add little pieces at a time of chilled butter (10-12 tablespoons total) and whisk until all the butter is used and the sauce is nice and creamy. Line up the serving plates. Place beurre blanc sauce at the bottom of the plate. Place one salmon mousseline (click on the link for the recipe). Un-mold one purple potato gratin and stack it on the fish. Add a dollop of crème fraîche. Garnish with some pink peppercorns and decorate with a sprig of fresh dill. Repeat until all the ingredients are used. Serve warm with steamed asparagus and a piece of baguette. I used store-bought crème fraîche but you can make your own if you have left-over heavy cream (click on the link for the recipe). It's super easy to make. Pink peppercorns have a delicate, fragrant, sweet, and spicy flavor. They are reminiscent of a mild citrus zest and sweet berries. 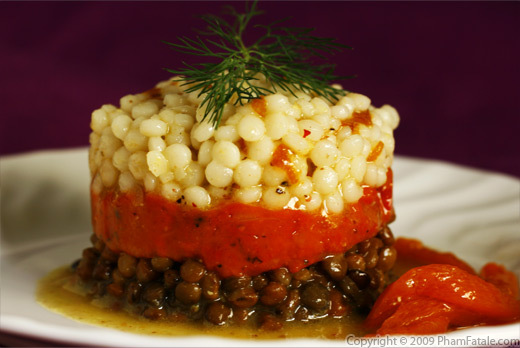 Pink peppercorns work especially well in fruit sauces, vinaigrettes and seafood. These peppercorns have a rich rose color that adds an elegant appearance to any cuisine. I just bought a very sharp plastic mandoline at a Korean store that was very inexpensive compared to the ones you find online. If you don't own one, you can use a sharp chef's knife. Place the potato slices one by one and gently press them. It will cook faster and will have a better presentation. You can use any other cheeses such as Beaufort, Comté or Monterey Jack but I think Gruyère suits this dish well because of its fruity flavor. 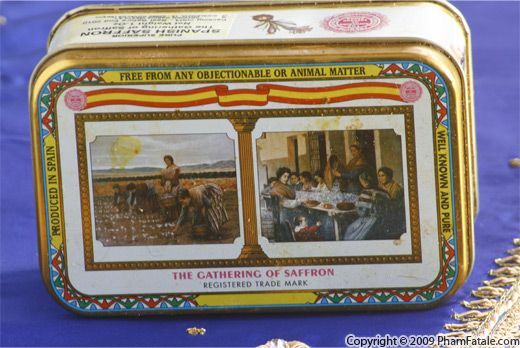 Saffron is quite expensive; I usually get it at a more reasonable price at an Indian market. It gives the sauce a yellow hue and a nice aroma. Beurre blanc sauce is perfect with any fish, shellfish, steamed vegetable, poached eggs or even chicken. If you add half the juice of a lemon and chopped parsley, then the sauce is called a sauce Bercy. 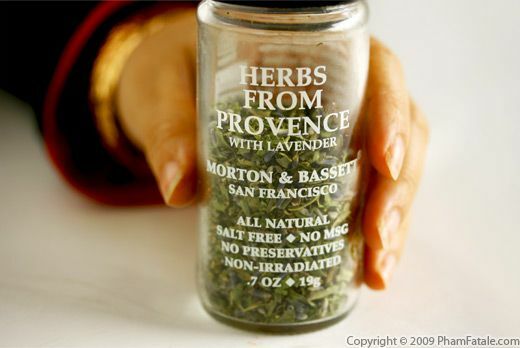 Herbes de Provence is a combination of herbs originating from the Mediterranean region. They're ideal for grilled meat, tomato sauce and ratatouille. You can create your own if you have the following ingredients: savory, fennel, basil, thyme, rosemary and lavender. Published By: Jacqueline Pham on December 21, 2009.